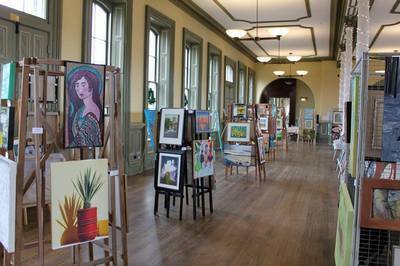 Each year, on about the second weekend in November, St. Thomas Art Guild members put on their biggest art show at the historic site of the old Southern Railway train station, CASO STATION, at 750 Talbot Street, Saint Thomas, Ontario. The show opens at 6:00 pm Friday evening and closes on Sunday at 5:00 pm. This is our BIG event of the year! Our invited judge, always an accredited artist, awards Judge’s Choice and Honorable Mention ribbons to the best art in the show. Each day, visitors get to vote on their favorite piece of art for the “Patron’s Choice” artist award given at day's end. The ambiance of this elegant, historical, restored building makes a special venue for an art show. Approximately 400 pieces of art by over 50 artists are on display, and the show grows better each year: The variety of art media includes: painting, sculpture, glass, textile, photography and mixed media. Our "tea room" offers coffee, tea and home-made goodies available for you to enjoy. We hope you join us for a cup of tea and a chat!